This is my first post here. 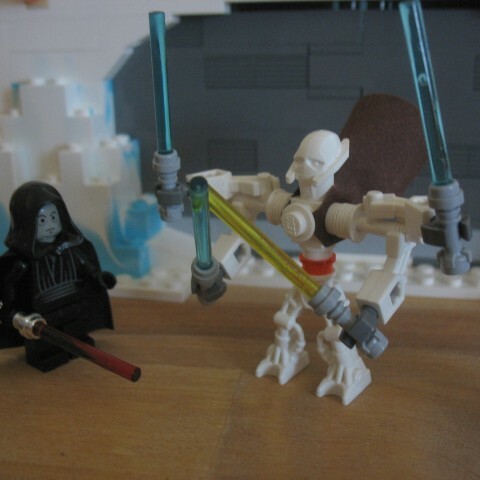 I build a General Grievous because I don't like the original model that much. I used his head, but the rest is made of new parts. What do you think about him? I think it's great how the different arm and hand configurations allow the sabers to rotate and be positioned in so many various positions. This certainly would allow you to pose him in so many more realistic ways than with the official fig. I like those legs on him, too -- the detailing seems much more representative of his mechanical legs then the ones LEGO used. It'd be great if they could bend at the waist, but the fact that this is obviously a figure meant for battle and not for sitting in a cockpit means he really doesn't need to bend, anyhow. So, good choice. Much more menacing than the normal minifig. Good job. Indeed, very good work. However, I can't help wondering.. how would a sleek, little plate on his chest look? In addition, where's that wicked leg piece from? I don't seem to recognize it..
Oh, and the trans-yellow lightsaber is a broken antenna from one of my old space sets. So that's cheating I guess, but I don't have any green lightsabers. This fig is indeed cooler than the official version of Grievous, but the really distinctive feature of the character is his hunched-over pose. (You can almost see him steepling his fingers and muttering "Exxxcellent.") That'd be harder to do. He also needs a dramatic cape. 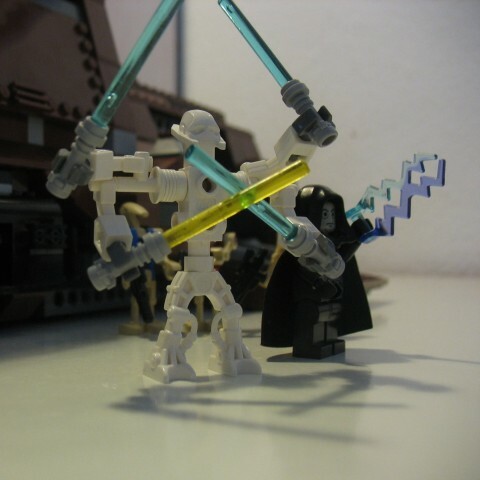 Specifically, this piece, from the minifig-scale Bionicle sets. They have the cool printed Barraki, Piraka and Toa Inika heads (like this), but which unfortunately don't fit on a standard minifig torso neck. I don't have any green lightsabers. Nobody has any green lightsaber blades, just TrNeonGreen (as Peeron names the color), more's the pity. TLG has never molded them in that color, although they've done sea grass in TrGreen recently. It's probably the simplest mold they have, but maybe it's part of their "reduce the number of separately warehoused elements" policy. This is a great MOC of GG. He's much shorter than I expected. Maybe because the body is too tall? This is great! The little orange stud throws me off a little it, I could do without it, but it looks great overall. Thanks. The orange light is his weak spot. But seeing episode III again I realize that his weak spot is actually hidden behind his chest plate. Oh well, I think it's a nice detail between all that white.